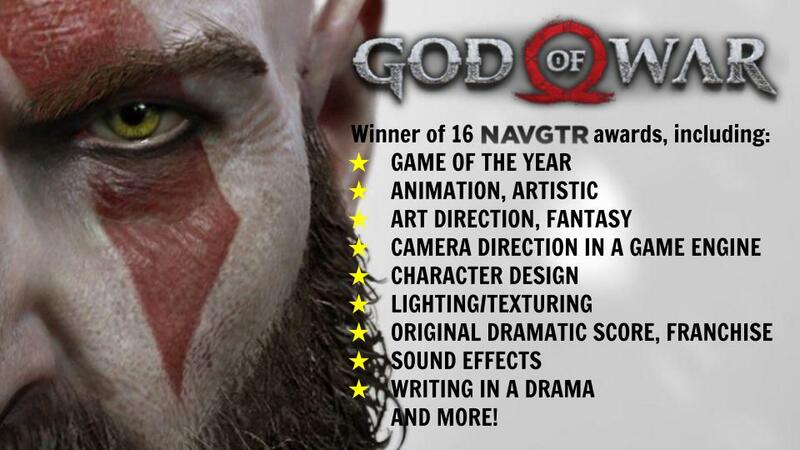 Most notably, Santa Monica Studio’s game won the awards for Animation, Design, Original Dramatic Score, and Performance in a Drama for Christopher Judge as Kratos. . . . The 2019 NAVGTR awards include 59 categories, so God of War wasn’t the only noteworthy winner. Epic Games’ phenomenon Fortnite received the award for “Game, esports.” Dragon Ball FighterZ beat tough competition in Super Smash Bros. Ultimate to win Game, Franchise Fighting. While Nintendo Labo won in the category for Game, Special Class. NAVGTR is a non-profit awards organization of 1,100 media voters and 8,895 subscribers that honors achievement in video game art, technology, design, and production. The 2018 NAVGTR award winners will be honored at PAX East 2019 in the War of Awards ceremony. For more information about NAVGTR and a full list of award winners, see the official NAVGTR website. This entry was tagged game awards, game revolution, games, Games PR, God of War, national academy of video game trade reviewers, navgtr, PAX, PAX East, PAX East 2019, PlayStation 4, PS4, santa monica studios, Sony Santa Monica, video game, video game awards, video game pr, video game pr agencies, video game pr agency, video game public relations, video game public relations agency, video games, video games pr, videogame, videogame pr, videogames, videogames pr, war of awards. Bookmark the permalink.